Ceramic and porcelain tiles are paradoxically very strong and at the same time somewhat delicate. These materials are very hard and durable, and when installed correctly they form extremely rigid and long-lasting floors that can last for many decades. But to perform adequately they depend on an underlying flooring structure that is also sturdy and rigid. If the underlying flooring structure—which usually consists of floor joists, a subfloor, and an underlayment—is not in good shape, the ceramic tile floor will flex underfoot, leading to cracked grout joints and a ruined installation. For this reason, ceramic and porcelain tile floors can be considered somewhat delicate, despite the inherent strength of the material. Because of issues of moisture, movement, and adhesion, ceramic tile will work well with certain types of subfloor/underlayment systems and can go dramatically wrong with other subfloor materials. It is important to distinguish the components of a flooring system in order to understand the best installation practices for ceramic tile. Except for slab floors, any flooring system consists of three primary components: the joists or structural support component; the subfloor, which is usually a layer of OSB (oriented strand board) or plywood; and the underlayment, a final layer that lies just beneath the surface flooring and which is selected to match the needs of the flooring material. Not every floor has all three components. In a home with a concrete slab foundation, or in basements, ceramic tile is often installed directly over the concrete slab. In any flooring installation, but for ceramic tile in particular, the success of the flooring depends largely on the quality of the underlying support system. There are six subfloor/underlayment structures that are widely accepted for ceramic tile floors. Now largely regarded as the very best underlayment for ceramic tile in any application—floors, walls, countertops—cement-based backer board goes by many names. It is generically called cement-board or backer board, or it can also be referred to by one of the common brand names, such as DensShield, Hardiebacker, and WonderBoard. Whatever it is called, cement-based backer board is what the name suggests: a layer of cementitious material faced with fiberglass mesh to hold it together. It is commonly sold in 1/4- or 1/2-inch-thick sheets, that are 3-by-5 feet or 4-by-8 feet in size. This is a heavy material, so the smaller sheets are somewhat easier to install, especially for DIYers. When it was introduced, cement-based backer board, along with thin-set mortar adhesives, largely revolutionized the ceramic tile business, since it made it possible for almost anyone to install a structurally solid base for ceramic tile. Previously, ceramic tile floors were generally installed on a wet-mortar base layer laid by a skilled professional. Introduced around 1970, cement-based backer board and thin-set adhesives not only made professional installation quicker (and therefore cheaper), but it also made it possible for everyday DIYers to install high-quality ceramic tile jobs. Exterior plywood is an acceptable underlayment for tile and is preferred to interior-grade plywoods because the bonding adhesives used are waterproof. If water seeps through the tile installation to the underlayment, it will not cause the wood to swell, as happens with interior-grade plywood. When used as an underlayment, the plywood sheets are laid over the OSB or plywood subfloor, for a two-layer base. It is important for seams not to overlap between layers, and it's generally recommended that the screws attaching the top underlayment NOT go all the way down into the floor joists since some degree of lateral movement needs to be allowed. It is important to note that this is no longer a preferred method of installation by professionals, almost all of whom will install ceramic tile over cement-based backer board. But it is possible to install tile over plywood, and in fact, this was a very common method prior to the invention of cement board. A concrete slab is also a good ceramic tile underlayment. In fact, it is one of the very best underlayments, since it closely resembles the solid mortar bases that were once the norm for ceramic tile installations. It is important, though, for the underlying slab to be perfectly flat and level, and for it to be stable and not prone to settling or heaving. And you need to be careful not to tile over expansion joints in the underlying slab, which will cause the tile job to fracture. To reduce the possibility of cracking, an intervening material called an uncoupling membrane can be used. An uncoupling membrane disconnects tile from its concrete subfloor and prevents cracking in the slab from being transmitted upward to the tile job. Available under the brand names Schluter Ditra or Redgard Uncoupling Mat, this product is also known as anti-fracture membrane, crack isolation membrane, or crack suppression membrane. Once very common, mortar bed installations involve pouring a thin layer of cement mortar and embedding the ceramic tile directly into it. The layer of mortar usually has a wire mesh reinforcement embedded in it. One advantage of this method is that it allows the installer to accommodate small flaws and unevenness in the subfloor. But mortar bed installation requires considerable skill and time, and it is beyond the level of most DIYers. Professional installation can be quite expensive since this is a time-consuming method and good installers are rare and in high demand. A mortar bed also adds considerable weight to the floor. Mortar bed installation is therefore somewhat rare today, and you may not encounter it at all unless you happen to be demolishing a floor that was installed with this method. Mortar beds are still commonly used when installing ceramic tile bases in showers, however. Installing New Ceramic Tile Over Old? Two layers of ceramic tile will be quite heavy and can be more than the underlying joists and subfloor can adequately handle. A subfloor system that worked fine for a single layer of ceramic tile may not be strong enough to handle the many hundreds of extra pounds added when a second layer is added. An extra layer of ceramic tile adds substantial thickness to the flooring layer. This may be a problem if it creates a noticeable offset to adjoining floor surfaces, such as between a ceramic tile kitchen and wood-floor dining room. It can also require that doors be trimmed and trim moldings reinstalled to accommodate the height changes. To test if your vinyl floor has been installed with full-contact adhesive, use a utility knife to cut a small slice at the center of the floor. Use the blade tip or sharp screwdriver to try to lift up the vinyl. If it does not lift up, it is full contact vinyl. When installing tile over sheet vinyl, make sure to use a specialty thin-set adhesive that is formulated to bond to vinyl. Overly glossy, or cushioned vinyl flooring does not work very well as an underlayment for ceramic tile. Opinions differ on whether or not ceramic tile can be laid over vinyl composite tiles. There is one school of thought that believes that if the vinyl tile is a full-bond installation (not peel-and-stick) and is in good shape, then ceramic tile can be laid over it under the same conditions as for full-bond sheet vinyl. Other professionals, though, feel that the many seams in a vinyl tile installation make it a poor choice as an underlayment. One common option with existing vinyl flooring of either kind is to apply a layer of 1/4-inch-thick cement backer board over the vinyl as a secondary underlayment. This can be a good solution, provided the extra thickness does not create difficulty. While many industry sources, such as the Tile Council of North America, approve of these six underlayment options for ceramic tile, not all contractors or industry organizations agree. 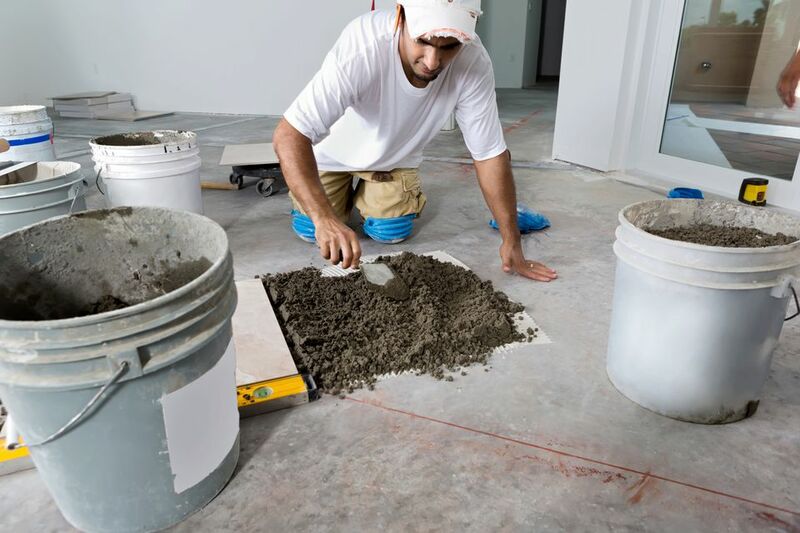 Trade organizations that serve the professional installation audience may argue that removal of the existing underlayment and installation of new cement-based backer board is the only method that truly guarantees a trouble-free ceramic tile job. Such opinions have some credence, since these trade organizations are devoted to making sure that professionals have few call-backs for installation failure. If you hire a tile professional, you may find that he or she resists installing ceramic tile over sheet vinyl, for example, or has other preferred methods. If so, it's a good idea to abide by their recommendations and trust their experience. The goal of any contractor is to avoid call-backs for failure, so if they recommend a certain method, they are probably doing it for good reason. Interior-grade plywood: This kind of plywood will swell upon contact with water, so it is best to avoid it as an underlayment. OSB sheets: Like interior plywood, OSB does not perform well with water. Multiple layers of vinyl: One layer of the vinyl floor is fine. More than one layer isn't. Perimeter-bond vinyl: Sheet vinyl must have a full bond over its entirety in order to serve as an underlayment for ceramic tile. Hardboard: Hardboard sheets such as Masonite do not bear up to any moisture, so avoid them as an underlayment for ceramic tile. Drywall or greenboard: Although ceramic tile is sometimes installed directly against drywall or greenboard in wall applications, it should never be used as an underlayment for floors. Can Cement Board Be Installed Over Concrete?